Set your foundation with a light dusting of powder. This will keep your base in place and ensure your make-up lasts longer. Work the lipstick into your lips with a lip brush. This will help the lipstick stay put all through the night. Offset your statement lip with this beautiful luminous eye shadow. Perfect the outline of your lips with a matte lip pencil. 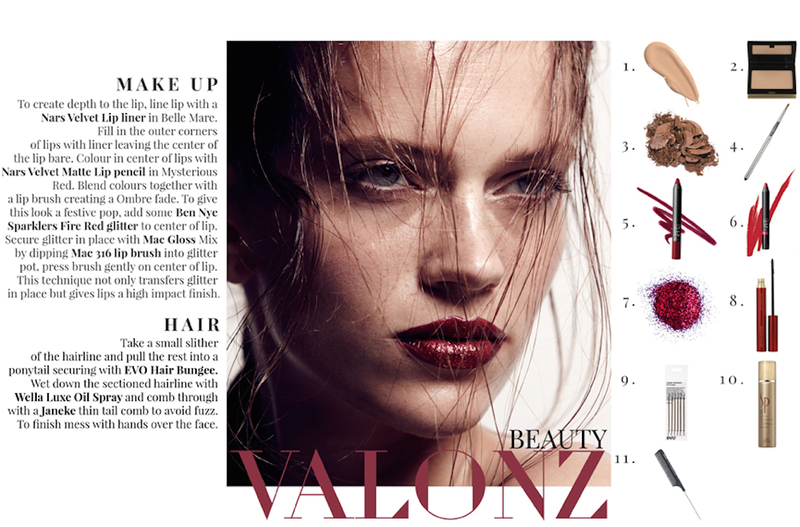 Make your vibrant and bold with this eye-catching deep red hue. Take your lips to the next level by adding a touch of sparkle. Add volumes to your lashes and make your eyes pop with this feathery thickening mascara. Secure your tussled tresses with a bungee- it’s easy! Moisturise and add shine to your hair with a light misting of Luxe Oil Light Spray. Tuck in any flyaways with your comb.